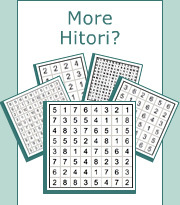 Hitori puzzles can be played interactively on the computer, offering many features and advantages compared to pencil and paper. This section explains everything about how to play Hitori on the computer. If you are not yet familiar with the puzzle rules, please go to Hitori rules. Hitori interactive is played by shading and un-shading squares in a grid. First click un-shades the square, second click shades the square and the third click brings the square back to its original state. Mouse clicking order may be reversed using the Preferences dialog box. Check all shaded and un-shaded squares for errors. Show conflicts: Check this box to automatically show conflicts during the game. A conflict means two shaded squares are adjacent to each other or two un-shaded squares with the same number are in the same row or column. Auto complete: Check this box to automatically shade squares when a square with the same number is un-shaded in a row or a column or un-shade adjacent squares when a square is shaded. Show gridlines: Check this box to show the puzzle gridlines. Reverse clicks order: Check this box to reverse mouse button clicking order. In the reverse order, first click shades the square, second click un-shades the square and the third click brings the square back to its original state. Open How to play Hitori page you are reading now.